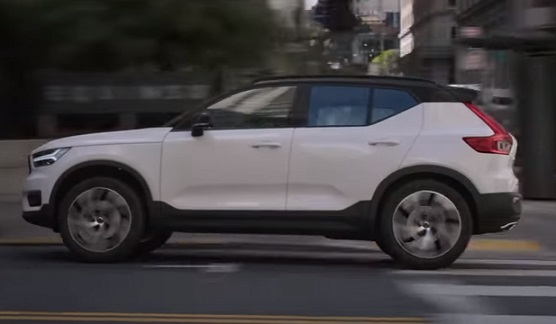 Volvo showcases the new Volvo XC40 in a new ad, aimed at highlighting that this compact SUV is designed to simplify busy urban lives. The spot includes footage of a white XC40 driving through the city juxtaposed with footage of two different couples talking over the phone and meeting up for coffee and lunch. The youthful exterior design, which was – according to Ian Kettle, lead exterior designer, “influenced by sci-fi movies and consumer electronics,” with focus on the large wheels and tyres, designed to cope effortlessly with any road, the interior, which boasts an easy-to-use centre touch screen and a high-resolution driver display, are some of the key features shown throughout the ad, which sees one couple grabbing two coffees from a coffee shop and having then a package delivered to their XC40 and another couple getting together after he ends his morning run by the sea. They are also seen catching up while having lunch on the top of a building, near their XC40. The soundtrack music is the 2017 single “Aqualung” by Swedish singer Linda Carlsson (better known as Miss Li). Volvo’s small SUV “that’s big on innovation,” which also intelligent all-wheel drive technology, that provides extra traction, with minimal increase in fuel consumption or emissions, and a suite of driver assistance technologies such as City Safety (standard for every Volvo XC40), which identifies other vehicles, pedestrians, cyclists and large animals ahead, issuing a warning if a collision is imminent and braking automatically, if necessary, to help avoid or mitigate a collision, and Pilot Assist, which automatically maintains a steady speed and distance to the car in front, and even helps steer the car, keeping you within lane markings, was awarded the European Car of the Year 2018.